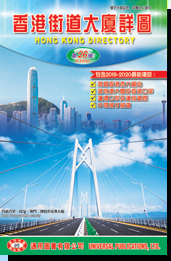 Similar to "Hong Kong Guidebook" but larger in size, this book is designed for easier reading . Its feature includes different colour for different kinds of buildings, minibus routes in detail, places of shopping centres and restaurants. QR codes are added on every page, once scanned by mobile devices, indexes of building, streets, shopping places, and restaurants appear. You can even make booking through the websites and download bonuses.